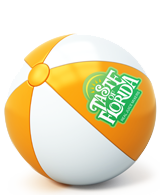 For 21 years (woo hoo we’re finally legal), Taste of Florida has been providing customers across the country with satisfaction that only comes from “Real Juice Mixers”. What started out as only a dream has grown into a product enjoyed in close to 40 states. Made with real fruit juice and fruit puree, Taste of Florida Real Juice Mixers has only one goal: to make your drink taste better. As their clientele has grown, so has the brand’s reputation for high quality products. During this year’s LA International Spirits Competition, the spotlight shined bright. Competing against tastemakers from around the world, Taste of Florida more than held its own. The Spicy Bloody Mary mix, a year-round favorite for connoisseurs of quality cocktails, was awarded a gold rating, scoring 92 on a scale of 100. With a price point lower than many of its competitors, it is sure to excite the palette and the wallet. Since no summer would be complete without an ice cold frozen beverage, reach for a Taste of Florida Pina Colada mixer, the highest-rated entry in the Pina category during the competition. This show of excellence proves that Taste of Florida is truly liquid gold when it comes to premium drink mixers. The LA International Spirit Competition wasn’t the only organization to raise their glass to Taste of Florida. At the SIP Awards the Spicy Bloody Mary mix once again held court, taking home the Platinum medal. Spicy Bloody Mary and Pina Colada weren’t the only Taste of Florida mixers to receive high honors. Blue Curacao, Melon and Watermelon all earned silver awards. Only one question remains after such an impressive performance amongst the industry elites: what’s next? For Taste of Florida Real Juice Mixers the answer is, “Everything!” With new flavors and exciting recipes in development, the glass is always completely full. As the summer days get a little hotter and the nights a little longer, Taste of Florida is the perfect accompaniment to any drink you can mix up.